Senator John McCain will be buried at the U.S. Naval Academy in Annapolis, Maryland a day after a national memorial service in Washington. Senator John McCain (R-AZ), who passed away on Saturday, will be buried at the U.S. Naval Academy in Annapolis, Maryland, on Sunday, September 2. He will be laid to rest next to his Naval Academy classmate and friend Admiral Chuck Larson, according to a schedule of events from his office. McCain graduated from the Naval Academy in 1958. "As classmates at the U.S. Naval Academy and Naval Air Station Pensacola flight school, Senator McCain and Admiral Chuck Larson developed a close friendship that endured throughout their adult lives," said the statement from McCain's office on Sunday. 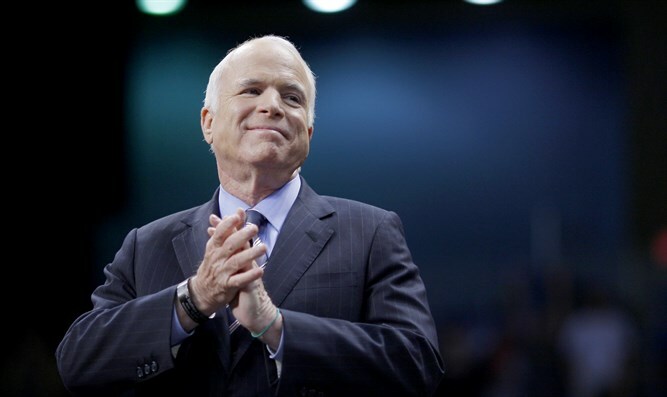 His burial will be held a day after a national memorial service at Washington National Cathedral in Washington, D.C.
McCain is scheduled to lie in the Arizona State Capitol on Wednesday and the U.S. Capitol on Friday, according to the release. Tributes to the Senator poured in on Sunday, including from Israeli politicians from across the political spectrum. Prime Minister Binyamin Netanyahu eulogized McCain in a video statement on Sunday. In the statement, Netanyahu recalled the “many, many times” he had visited McCain in the US Senate, and the “many times” McCain had reciprocated with visits to Jerusalem. "I wish to extend my condolences to the family of Senator John McCain, a great American patriot and a great friend of Israel. I've known John McCain for many, many years. I visited him in the US Congress many times. And he visited me in Jerusalem many, many times, including in recent years. Israel has never had a greater champion and a greater defender. The State of Israel salutes Senator John McCain."